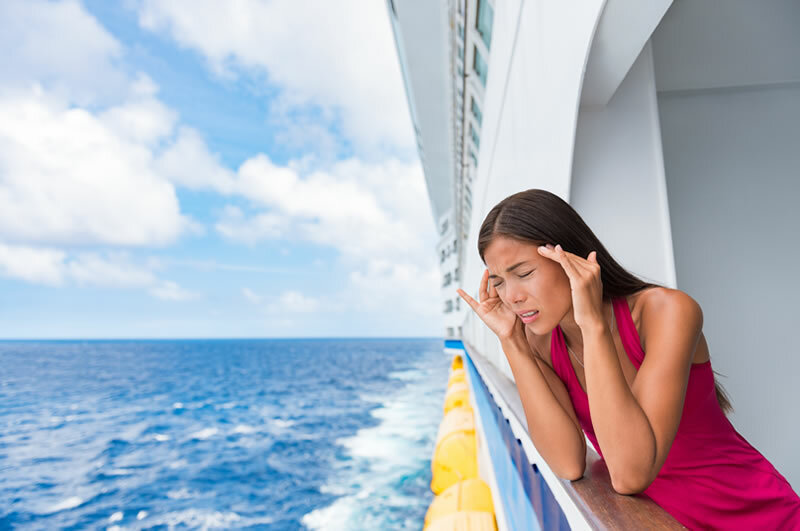 Motion sickness on a cruise won’t cause serious damage, but it will make your vacation absolutely miserable. There’s nothing worse than spending a whole cruise in bed after you’ve been planning and packing for weeks. So let’s take a look at what motion sickness is and how to avoid it on your next cruise. 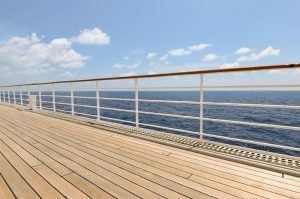 Why Do I Get Motion Sickness on a Cruise? Your body has a balance-sensing system, which includes your inner ears, your eyes, and your sensory nerves. You start to feel motion sickness when one of these balance-sensing systems don’t match up with all the rest. For example, if you’re in the cabin of a moving ship, your ears will feel the rocking of the waves but your eyes won’t see any movement. Because one sense says your body is moving and one sense says it’s not, the entire system gets confused. This conflict causes motion sickness. Anyone can get motion sickness, especially on a cruise. Depending on where your cruise is and what kind of boat you’re on, it’s important to remember every cruise will feel different. So someone who has never experienced motion sickness on a cruise before might feel sick on a cruise they’ve never tried. That said, motion sickness is most common in children between five and 12 years old, women, and elderly. It doesn’t seem to affect children under two years of age, so don’t worry about your toddler getting sick if you’re traveling with them. There are several symptoms of motion sickness, which can all be wrapped up into a general sense of feeling ill. If you ever get motion sickness on a cruise, there are several things you should stop doing to make sure it doesn’t get worse. – Don’t stay below deck for an extended period of time, especially if you aren’t around any windows. Your inner ears will feel the rocking of the boat, but all your eyes will be able to see are solid walls. – Your eyes know from experience those walls shouldn’t move, so being inside could make your sickness worse. Being on deck will allow you to see the horizon and the water moving around you. – You should also stop any activities like reading or sewing. Again, looking at these items that your eyes think aren’t moving can bring on a new round of motion sickness. The best way to deal with motion sickness is to prevent it before it happens. There are a lot of things you can do before you hop on a cruise that can spare your vacation headaches and upset stomachs. 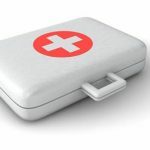 Bonine and Dramamine, both over the counter medications, can make a big difference. These medications can make you tired, so make sure you get the notion-drowsy kind. Start taking them a day or two before your cruise for the best effect. If you want to avoid medication, you can pick up a Sea-Band at most major drug stores. These cotton braces are worn around your wrist, and they have hard beads that press against the inside of your wrist. This will act much like acupressure and relieve motion sickness. A lot of big cruise ships have things called stabilizers, little “wings” that extend off the bottom of the ship under the water, to keep them upright. This means less rocking and less chance of getting motion sickness. Low, center rooms are the closest to the stabilizers. If you are worried about motion sickness, these rooms will be the best for you. At least until you get your sea legs. Watching the horizon (but not constantly staring at it) will help your senses stay in tune with each other. The fresh air will also feel nice and relaxing. If you do go in the cabin, try to stick around places with windows. The smaller they are, the more movement you will feel. Smaller ships are also less likely to have stabilizers, so your chances of getting motion sickness on a smaller vessel are higher than on a larger one. Stick with big cruise ships for a pleasant vacation. Cruise ships are well known for their wide selection of luxurious foods, but if you’re worried about motion sickness, a lot of those foods are probably things you should avoid. Eat light meals that avoid fatty foods, sugar, and too much salt. You may also want to hold off on the alcohol, at least for the first day or two. 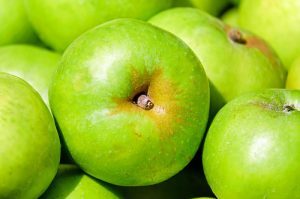 If your stomach does end up feeling upset, ginger, saltine crackers, and green apples are natural foods that will soothe your stomach. Some cruise ships actually offer these foods on their room service menus. If you aren’t an experienced cruiser, you should test out a few short cruises first, cruises that are only two or three days long. This will give you a chance to experience a cruise, but you won’t be stuck on board for multiple days if things go bad. Another way to test the waters is to find cruises that have a lot of opportunities to port and get off the ship. This will give you a break from the constant rocking of the waves. If you are worried about getting motion sickness on a cruise and are constantly stressing about it, odds are you’ll get it. The mind is very powerful, and it can make you feel motion sickness even if you wouldn’t have naturally felt it. This is especially true if you experience motion sickness during car rides, plane rides, carnival rides, and train rides. Your stress of past motion sickness can actually make you get motion sickness again. So don’t work yourself up. If you start to notice signs of motion sickness on a cruise, address them right away before they have a chance to get worse. This means going to the deck if you’re in the cabin, putting down your book, or choosing healthier, lighter meals. Ready for your next cruise? Check out some of our cruise excursions!